Because of its geographic situation, exposed to sea winds and yet with rolling fertile hills, Normandy is a paradise for gardeners. It is also historically significant, home of William the Conqueror and site of the D-Day landings. We explore iconic gardens such as Princess Sturdza's Vasterival in Varengeville and the Bois des Moutiers designed by arts and crafts genius Edwin Lutyens. Château de Brécy's Italian renaissance garden is a highlight. 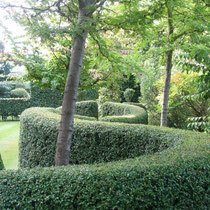 A trove of smaller private gardens, all horticulturally significant, await us. Some are contemporary, others more traditional, all are delightful. A visit to the D-Day sights and the Tapestry of Bayeux round off the programme. Last but not least, we stay in comfortable manor hotels, typical of the region, where we enjoy the culinary delights of this land of calvados, creamy cheese, grass fed beef and seafood. Based in Bayeux and Honfleur. Six days. Summer or fall. 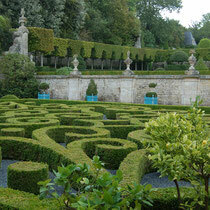 We will treasure the wonderful memories our our Normandy gardens tour. Thank you for taking such good care of us. My head is still spinning with wonderful images of Normandy. What a trip you gave us! So many beautiful gardens and all so different from one another. Thanks from all of us for your skillful, informed, tactful guardianship on our Norman journey. What a botanical feast you have given us! I am so appreciative of your intelligence, experience and good cheer - and the way you always make sure that we fell totally taken care of. A million thanks! In the morning we visit Jardins de Castillon, Plantbessin, a delightful award-winning private garden started in 1982 around a nursery . Lunch in Bayeux and visit of the famous Tapestry of Bayeux, listed as a „Memory of the World“ sight by UNESCO. In the afternoon we visit Château de Brécy, a most unusual Italianate garden, restored to near-perfection by the owners. In the morning we visit Le Bois des Moutiers, Varengeville. The house and garden were created by Robert Mallet starting in 1898 with the assistance of Edwin Lutyens and Gertrude Jekyll. The property has been in the Mallet family for more than 100 years and is a rare example of Arts and Crafts design on the continent. In the afternoon, we tour Le Vasterival, in Sainte Marguerite sur Mer, the life work of the late Princess Sturdza who started it in 1957. Its renown is based not only on its botanical diversity but also on its brilliant landscaping which offers something of interest for the visitor at every season. On our way back to Paris, we visit Château de Miromesnil, Tourville-sur-Arques : a lovely potager garden around a historic château. After lunch at a local Norman Auberge our final stop is Le Jardin Plume, a contemporary private garden combining a formal use of space with an innovative use of plants and sculptural mowing of grasses. We reach Paris in the early evening.